Adapted Work Binders® are one of the most beneficial ways to not only supplement your current curriculum, but introduce and teach grade level concepts on the ability level of your student. Teachers all over the world have been implementing this strategy and have seen massive gains in student success. This post may contain affiliate links for your convenience. View the full disclosure policy here. Adapted Work Binders® (AWBs) are functional for any classroom or curriculum, are easy to differentiate, and provide the learner with grade level content in a way that the child learns best. But starting out can be overwhelming, time consuming, and honestly… really, really EXCITING!! So today I am going to answer the questions that I receive the most about AWBs – what they are, how to use them, what supplies you need, and all of your other burning questions. 3- What subject(s) do you want to practice? The easiest way to determine which AWB is right for your child, is to take this quick 3 question quiz. It will help you determine which binder to start with or prep next. Now that you know which binder to start with, you need to know what supplies you need to get started. You can typically find thermal laminators for less than $20 at WalMart or Target. I know that craft stores often have them too, and you can use a coupon on them. They’re super inexpensive! If you are a teacher and need to order more Velcro in bulk, I suggest ordering from FeinerSupply. Just keep in mind that the hook Velcro and the loop Velcro come separately, so make sure to order both types of dots. HOW MUCH VELCRO DO I NEED? This is a really hard question for me to answer because it is so dependent on what workpages you start with. You can, however, bank on having 500- dots of each (hook and loop) and at least 25 feet of the loop strip velcro. That’s a great place to start. DO I PRINT THE ENTIRE BINDER? No. Please do not ever print an entire binder to start. I mean, you can… but I don’t recommend it. Not only is that A LOT to print, but that’s A LOT of prep work. I always suggest starting with 20-25 workpages, and then adding more as the child progresses through and masters those skills. Not only does this cut down on your initial prep time, but the child isn’t going to be overwhelmed in the beginning with a huge work binder. The greatest thing about Adapted Work Binders® is that the implementation is completely up to you. You can use it to supplement your current curriculum, use it to fill in the gaps in your curriculum, or use it as your curriculum. Because many of the binders are standards-based and differentiation is provided for each skill, you’re covered. HOW DO YOU USE AWBs IN YOUR CLASSROOM? We start every morning with parts of the Morning AWB®: personal pages (name, address, phone number, etc.) and all of the calendar pages (days of the week, months, weather, etc.). Each student has their own binder. So if I have 12 students, there are 12 Morning binders. WHAT ABOUT THE OTHER BINDERS? Again, this is just one example of what it may look like in your classroom, but it is not the only way. You make the binders work for you in your classroom. WHERE DO YOU KEEP ALL OF THE EXTRA ANSWER PIECES? I use a bead divider to keep all of my answer pieces sorted for the Morning AWB®. Because we change out the month on a, well, monthly basis… each student of mine has their own bead divider. While this may not be feasible for everyone, it is something that works for me. You can see more storage hacks in the video at the end of this post. HOW DO YOU GET ALL OF THE BINDERS RE-SET FOR THE NEXT USE? I teach students to do this, and it’s a skill we work on from day 1, especially in our Morning binders. After a student finishes his binder, I will teach the child to flip back to the beginning of the binder (or the first page he worked on), and then move all of the pieces back to the baseline (the line of Velcro at the bottom or side of each workpage). In the beginning of teaching students this management skill, I will go through and check the binders after to make sure they have been “put back”. From experience, and for the most part, the kids put the pieces back in no specific order. But if I have a child that puts them back in order, I will either teach this child to mix up the pieces or I will mix up the pieces at the end of the day. HOW DO YOU KEEP THE BINDERS CLEAN? For workpages that students can write on, we use dry erase markers. I’ve found that black, purple, and green don’t stain the pages as much as the other colors. To clean the marker off of the pages, I use Mr. Clean Magic Erasers to clean them. I will cut one Magic Eraser in half to save on costs. Again, as with the baseline of answer pieces, I teach students to clean their workpages when they complete them. HOW OFTEN DO YOU UPDATE A BINDER? For the Morning binder, it is updated monthly to reflect the month (since we work on spelling the month). If I have created a student specific binder with workpages the child is struggling with or has IEP goals on, I will update the binder when the child has mastered a skill or multiple skills within the binder. It’s kind of like a work bin or IEP bin for children, but in binder form and has everything ready to go. HOW OFTEN DO YOU CHANGE OUT WORKPAGES AND ACTIVITIES? Once an activity has been added to the binder, it doesn’t get removed. But that doesn’t mean the child works on that skill every day or every time they are working within a specific binder. But it’s completely up to you. You make the binders work for YOU. For my classroom, the only student specific binders are the Morning binders. So I have one full set of the Math AWBs® on my shelf, as well as the ELA and Science and Social Studies binders. When I want a child to work on a skill within a binder, I will take certain pages out of a binder and have the child work on those skills. You can easily do this by putting them into an empty 3-ring binder, or by just having them complete the workpages wherever they’re working. I did a Facebook Live a few weeks ago about great storage hacks for your AWBs®. You can find it here, or watch below. 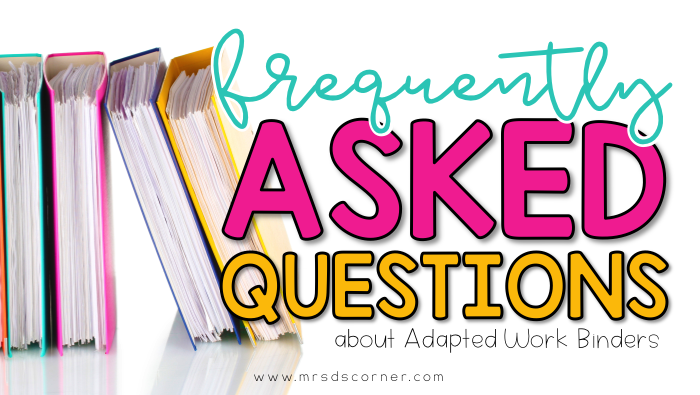 What questions do you still have about Adapted Work Binders®? Leave a comment below and I’d be happy to answer! I recently purchased your morning calendar binder. Where are the alphabet pieces for the name and numbers for the address? Did I miss them somewhere? Please check the folder labeled “Editable”. You will use the PowerPoint in that folder to create your own answer pieces for the name, address, etc. workpages. What size binders do you suggest getting? I printed most of the pre k binder and doesn’t fit in a 1 inch. My plan is to add dividers to separate the binder with letters/ numbers/ feelings etc and have the student work on one section at time but want all together since there isn’t much storage space in my room. do you have pics of some of the pages from the ELA or Math binders? I’m a reading specialist during the school year so I’m wondering if they would work for my k-5 kids. But for the next few weeks I am teaching math to very low special ed high school students. I know they are going to be fantastic I just don’t want to purchase them all if it wouldn’t be a good fit for them since they aren’t my normal students. Hi Stephanie, I purchased the Digital AWB and I am curious as to how I use it for each student’s iPad in class? What card stock do you use? Link? Do you hole punch before or after laminating? I use regular copy paper now, but when I used cardstock I used regular cardstock from WalMart. What size binder do you use to store your classroom set of AWB? Will a 3″ binder work or do I need a larger one? When you use regular copy paper, and laminate do the pages come apart. My school laminator is not a thermal, so I a trying to decide if it is better to use my laminator or the schools. I is a lot of material and I can have it laminated at school since it is for school use. Please advise, and my apologies for all of the questions. It depends on which AWB you are creating a class set of, and how you want it organized. 🙂 You can always send me an email if you have questions! I am having problems with my kiddos not being motivated to do their morning work binders. Some are excited and son groan. How do you motivate your students in the morning? Are the workpages you chose for the student too difficult or above the child’s independent work level? If the workpages you chose are on target for the student’s ability level, what motivates the student to do other work in your classroom? Have you tried a token economy or if, then chart? Hi, Mrs. D, thank you for sharing your amazing resource! When I click the link above for the Quick 3 question quiz it says the quiz is no longer available. Do you have a new link perhaps? I do not have an updated link. You can send me an email if you have questions about which binder will be best for your students. Hi there! I was wondering if you still had the 3 question quiz available? Unfortunately, the website I used to create the quiz no longer works. Is there something I can help you with? Yes, I believe so. You would just choose the AWB that includes skills your students are working on.